I’ve written about arts and crafts many times; it’s a favorite subject of mine, and has always been a focus in every classroom I’ve had, at schools and at home. I’ve always made sure that children have plenty of time for art, as well as all the art supplies they might want: paint, colored pencils, clay, markers, and plenty of paper. First written almost 25 years ago, it’s available in a revised and expanded 10th anniversary edition, which is the one I am using. Drawing with Children takes a systematic look at teaching children to draw. When developing this method, Brookes had to face conventional wisdom that says drawing is something children should just “do”; they shouldn’t receive lessons on the subject. Brookes took a look at all the other curricular areas and realized that we give children lessons in math, reading, geography, music, and dance without a second thought. There’s no reason why we can’t approach drawing in the same way. After ten years of use in schools, homes, and art studios, her method has been shown to empower children to produce amazing artwork. 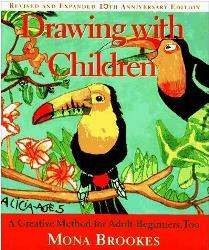 I decided to use this book with my own children, giving them a drawing lesson once a week. We began this past week, so I’ll outline how we got started and how we used the book as the basis for our lesson. Her book is subtitled “A Creative Method for Adult Beginners, Too” so I am joining my children in the exercises so I can improve my drawing skills as well. The first thing I did was read the book from cover to cover. Since this is an area where I feel weak, I wanted to understand her method (called “Monart”) completely. It’s highly readable and contains a wealth of information in addition to the actual drawing lessons. I appreciated how she addressed common myths: “There is a right and wrong way to draw”, Art lessons should only be given to children who show talent in that area”, etc. She talks about each myth and why they take hold in our minds, and brings to light the truth about art: “There is no right or wrong way to draw”, “Art lessons can be given to anyone” with a full explanation of each idea. She turned some of my ideas upside down; for instance, she has children use markers rather than colored pencils so that they have to plan carefully before they draw and deal with their mistakes rather than erase them. (I thought erasing was good!) She has an entire section on what to do when you don’t like something you’ve drawn. The suggestions were extremely helpful. I went out and bought a set of thin-line and thick-line markers for each of my children. She recommends having both: the thin-line to draw outlines and the thick for filling in shapes and figures. I didn’t want to spend a lot so I bought a mid-price brand. She recommends using 8 ½ x 11 printer paper to draw on – I have plenty of that on hand. So purchases were minimal. When I sat down with my children I had already planned what I was going to tell them. I explained the reason behind the markers and showed them the suggestions she gave for dealing with a mistake. I explained that we weren’t going to even use the word “mistake” anymore; Brookes suggests saying “I like this” or “I don’t like this” about your own work, rather than using words with negative connotations. After we covered this introductory information, we started our first exercise. It involved experimenting with the markers (not trying to draw anything specific) to see what you can do with them. Then we moved into an introduction of the Five Basic Elements of drawing as developed by Brookes. Rather than being specific shapes, they include dots, circles, straight lines, curved lines, and angles so that by combining them, you can make every kind of shape imaginable. The idea behind these elements is that they make up everything we see (a door is a series of straight lines, filled in; the doorknob is a dot). If you can master these elements and begin to notice them everywhere, you can draw. My children (ages 6 and 9) understood these concepts immediately and were able to point out many examples of them around the room. They also created their own charts with multiple examples of each element. A chart of the Five Basic Elements is shown in the book and we used that as a jumping off point. After that, we each took a sheet of paper and created freeform pictures using different combinations of the Five Basic Elements of drawing. 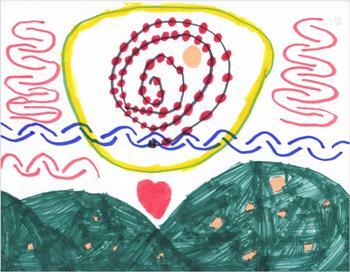 (Picture: My daughter’s drawing combining the five basic elements). Overall, our first lesson was a great success and my children enjoyed it immensely. It was fun and not tedious. We found the book to be very helpful, as it contains many pictures of drawings by children, usually showing something they drew before they had a Monart lesson and something after – the improvement is amazing. If I have one criticism of the book, it’s that I wish the lessons were laid out a little more clearly – each lesson has several parts and can be adapted for three different levels, so it’s not always clear what comes next. I was very glad I had read the book beforehand and taken notes on which page(s) to turn to for each step of our lesson. Still, I would recommend this book for any classroom or home in need of a structured approach to drawing. We’re definitely going to continue our weekly art lessons and I’ll check back in from time to time to share our progress. I’d love to hear any of your experiences with this approach, or perhaps another approach to drawing with children.